I was "browsing" the internet as you do the other day and came across talk about some hip hop DJ or something or another fella remixing some mainstream indie tracks (it's better than I expected to be honest!) But after further investigation I found out Riff Raff had in fact had a track played on Rob da Bank's Radio 1 show (skip about 15 mins - [link]). A remix of Radiohead's 'No Surprises' no less. So I did the right thing and gave it a listen. Good enough for Rob, good enough for me. Although Riff Raff doesn't add much musically to the song, it's reasonably interesting lyrically at least. It actually namechecks Mr da Bank, as well as The Libertines and lots of other things (having a thing for Jo Whiley?!). Savvy. The formula is similar on the other tracks he's done, take a contemporary indie tune, rap about everyday life over most of it, leave the anthemic choruses in. Sorted. Dare I call it "grindie"? Nah. I just hope he doesn't get sued! 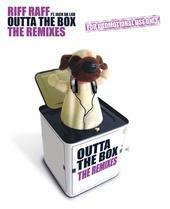 The remixes are part of a compilation called 'Outta The Box' and features reworking of tracks by The Kooks, Editors and even Jack Johnson of all people. It takes on Pulp's 'Common People' and 'London Calling' by The Clash along the way. Unfortunately my computer didn't manage to download any tracks that Riff Raff uploaded for listening, but by all means give it a go yourselves [link]. Alternatively, you can listen to a whole bunch of the tracks on a flash player on Riff Raff's MySpace [link]. Tracklisting and details of how to buy 'Outta The Box' on one of Riff Raff's MySpace blogs [link]. Dat's sick yo! (copyright Max at shakebeforereading.com[link]).